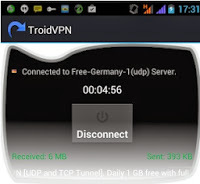 still having issues with Troidvpn due to lack of ICMP and their server is always crowded. But I have a good news for us this evening; just relax and read on. How Can Get The Test Download Link? Note: Before you download, unistall manually the older Troidvpn version on your android device. Required. Minimum Android 4.x.x or above. Unlimited Sessions In a day. 5 LOCATION – 5 FREE Server. No more Server Full message. internet surfing easier for everyone. hi prof, pls my PD PROXY VPN software using ICMP for pc browsing has just stopped connecting with mtn since dis evening. pls any solution? I just noticed it too on some couples of minute ago.. I don't want to conclude now that it's been blocked but lets wait and see what will happen before tomorrow morning. It not connecting at all at my end too. pls hw can i root my torch 4g htc fone pls send to my mail [email protected] thanks and regard. GOOD NEWS GUYS….JUST CONNECTED FINALLY WITH MTN BIS AND PDPROXY USING ICMP PROTOCOL…. BT U NEED TO GO BACK TO THE NORMAL APN WEB.GPRS.MTNIGERIA.NET,, USING IT RIGHT NOW TO TYPE DS….. Mine is not working on Droid vpn. Is it only on PD proxy? Icmp not working on drroid vpn and troid vpn with blackberry.net I don't know if it would work with web.gprs.mtnnigeria.net any ideas ?